Inés Del Castillo (Inés García Ruiz) was born in Sagua de Tánamo, Oriente, Cuba. She studied at the Félix Varela and Rosalía Abreu schools. After finishing her third year of studies in education at the University of Havana, she moved to New York City where she still resides. Inés has studied literature at Hunter College. She began to write verses at an early age. By the age of thirteen, her poems had been heard in her home town. Before leaving her homeland, she published several poems in El Diario de Cuba and El Diario de la Marina. In the United States she's been published in various newspapers and magazines; these include: Diario las Américas, Circulo Poético Panamericano, Gaceta Lírica, Aplausos and Osiris, the last is an international magazine published in various languages. 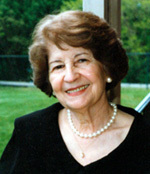 She is recipient of the René Marqués Award, Kingsborough College, 1979; the José Martí Award, New York, 1987, and the Agustín Acosta Award for Poetry (Gala), 1990 for her book Inmanencia de las Cenizas. In addition, she has several honorable mentions, among them for Circle of Time, her first poem written in English, World of Poetry, California 1990. Her work has appeared in anthologies including Poetas Cubanos en Nueva York, Betania Publishers, Madrid, 1988. She is included in the Diccionario Biográfico de Poetas Cubanos of Pablo Le Riverend, New Jersey, 1989, and in Poetisas Cubanas Contemporáneas of Darío Espina Pérez, Miami, Florida. 1989, Senda Nueva de Ediciones presented Hierba Azul, fifty lyrical poems. Several unpublished books and short stories include: Tierra Parda, Rosa y Madero, El Caracol, Grisantina. "Her poetry emerges serene, original, without pretense and with particular delicacy, distinction and elegance, without lacking, at the same time, vigor and depth." "There's a spontaneous rhythm and a variety of metric forms, but above all, there is a plasmic lyrical quality, produced from a genuine sensibility."